If you'd like to save your report, you can do so by clicking on the save button in the right hand corner of your report. This is handy when you want to come back to it later and don't want to have to fiddle with the report criteria and settings again. Once you've saved a report, you can view it by going to your Reports tab in the green navigation sidebar. Your report will appear in a list of any other reports you or one of your team members have saved before. All leaders and supervisors in your account can view saved reports and create new saved reports (other people can only run reports, limited to which projects they are assigned to, with contractors only being able to see their own time). You can choose to delete any saved reports by clicking on the delete button (that's the one that shows up when you hover over a report and has an x in it) to the right of the report name. 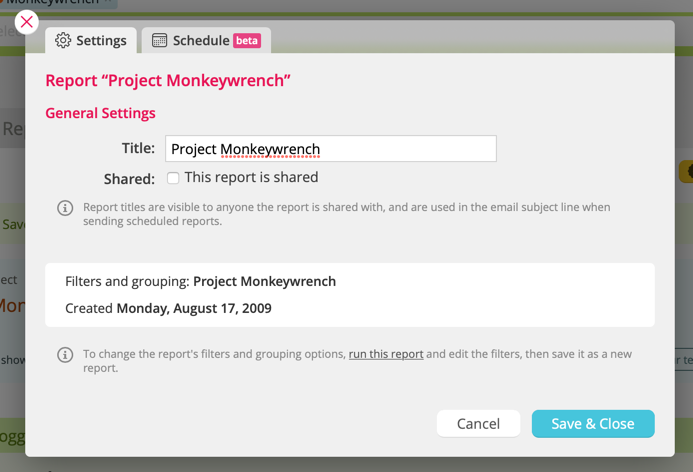 You can also rename, share, or schedule a report by clicking on the settings button (that's the one with the gear). 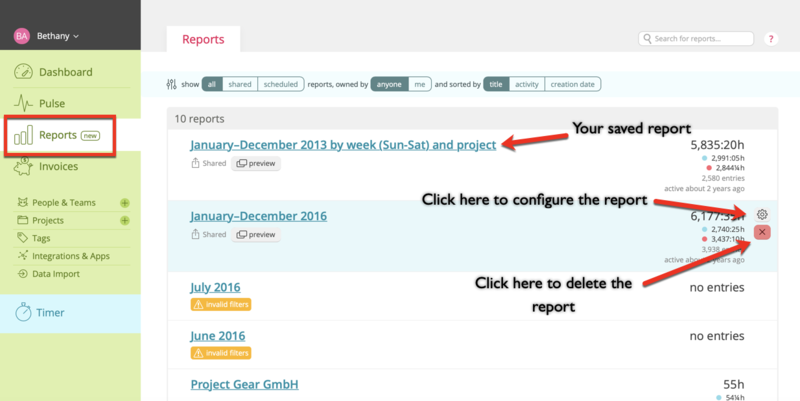 You can give a report a custom name, share, and schedule a saved report by clicking the settings button from the Reports page or from the report itself.